Hobbies: Snowboarding, wakeboarding, dirt bikes, fitness training, passion for flying, and enjoys following his hometown Atlanta Braves baseball team, college football (favorite team is Georgia Bulldogs), country music (favorite artist is Eric Church), and NFL football. 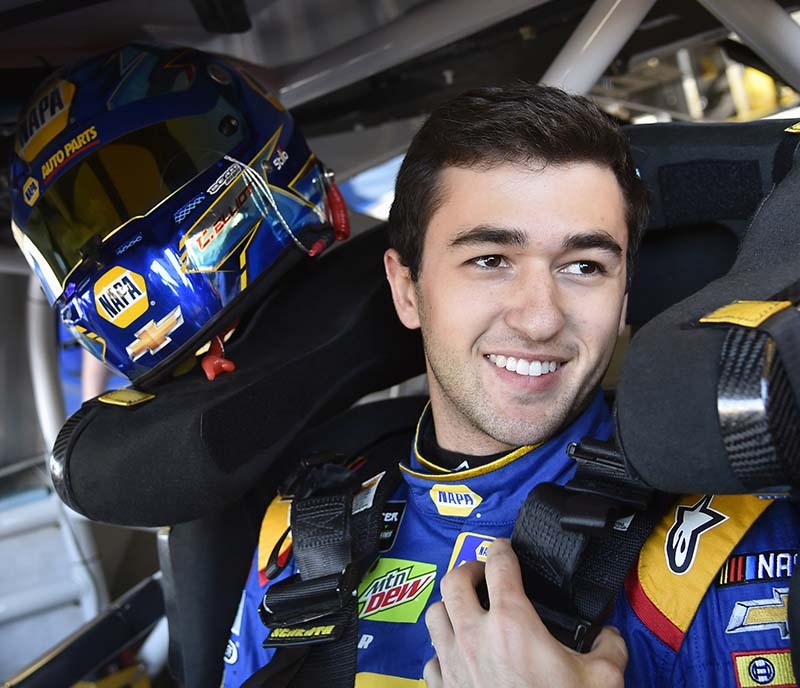 The Elliott name has been prominently featured in NASCAR for nearly 40 years, and Chase Elliott is doing his part to keep it that way for decades more. The 22-year-old Elliott notably has won in every level of racing, from NASCAR Cup Series, NASCAR XFINITY Series, the NASCAR Camping World Truck Series, the ARCA Racing Series, the NASCAR K&N Pro Series, and countless late model racing series. The 2016 Rookie of the Year winning driver for Hendrick Motorsports drives the famed No. 9, the number his father Bill Elliott brought to fame in the 1980s. Elliott started his inaugural Cup season in 2016 with a bang taking the pole at the Daytona 500 and then raced his way into the Chase for the NASCAR Cup as only the third rookie to ever make the sport’s playoffs. In his second year in 2017, he again took the Daytona 500 pole and qualified for the sport’s playoffs again, nearly gaining his first career Cup win along the way. But like his father Bill, who finished second eight times before capturing his maiden victory at a road couse (Riverside, Calif.), Chase also was an eight-time runner-up before he reached victory lane on Aug. 5, 2018 on the 2.5 mile road course at Watkins Glen International. Also like his father Bil Elliott, a NASCAR Hall of Fame inductee and former Cup champion (1988), the younger Elliott also knows what it takes to win a championship, running away with the 2014 NASCAR XFINITY Series title in the No. 9 NAPA Auto Parts Chevrolet for JR Motorsports at age 18. In doing so at age 18, he became the youngest driver ever to win a NASCAR national series title. Elliott also became the first driver in NASCAR history to take home the trifecta at the season’s year-end awards – the Driver’s Championship title, Rookie of the Year, and Most Popular Driver awards for the XFINITY Series. Elliott nearly repeated his driver’s title in 2015, finishing a mere 15 points short of the XFINITY Series championship. However, he did repeat as the Most Popular Driver award winner, carrying on the tradition his father enjoyed over his long career as a record 16-time Most Popular Award winner in the NASCAR Cup Series. The younger Elliott ascended to the top spot of the NASCAR Cup Series Most Popular Driver Award in 2018, adding to the family legacy. Elliott’s foray into NASCAR began in 2011 when he signed a driver development deal with Hendrick Motorsports, winners of 10 NASCAR Cup championships, and made his full-time debut in the NASCAR K&N East Series. The next year he captured his very first NASCAR victory at Iowa Speedway on May 19, 2012. Elliott followed that up with an impressive 2013 campaign, winning his first ARCA Racing Series race at Pocono Raceway to become the youngest superspeedway winner in series history at age 17. Then he became the youngest pole winner in NASCAR Camping World Truck Series history when he claimed the No. 1 starting spot at Bristol (Tenn.) Motor Speedway. He followed up this milestone by becoming the youngest winner in a NASCAR national series race during the Truck Series’ inaugural trip to Canadian Tire Motorsports Park on Sept. 1, 2013. Elliott’s penchant for winning and setting records began even at an earlier age. Growing up primarily in North Georgia with the mountain town of Edwards, Colo. serving as a second home, Chase starting racing go-karts at age 8 and later moved up to late models. By age 16, he had competed against some of the best short-track racers in the nation and racked up impressive victories, becoming the youngest driver to win several regional series championships. In 2011, he won seven late model wins on his way to being a national champion in super late models with the Champion Racing Association (a division of ARCA). Then in 2013, Elliott reached the pinnacle of late model racing and accomplished the rarest of feats, becoming the first-ever late model driver to win the unofficial career Grand Slam of Super Late Model racing, which includes wins at the revered the All American 400, World Crown 300, Winchester 400 and Snowball Derby races. As a Dawsonville, Ga. native, Elliott continues the great NASCAR legacy of the small North Georgia mountain town that also includes his father Bill. The original “Dawsonville Gang” were four drivers – Gober Sosebee, Roy Hall, Lloyd Seay and Bernard Long – who won races on Daytona’s beach/road course from 1941-59. In fact, during the 1940s, 12 of 15 of those races were won either by drivers or owners hailing from the small community. In addition, NASCAR Hall of Fame inductee (2017 class member) Raymond Parks, another Dawsonville native, owned the race car in which Red Byron won the inaugural NASCAR premier series championship. The elder Elliott became the fifth Daytona winner among the “Dawsonville Gang” when he won the 1985 Daytona 500. The next generation Elliott kept the Dawsonville Gang string of success in Daytona alive with his XFINITY Series race win in 2016 during Daytona Speedweeks. Elliott has earned many accolades off the track as well. Elliott won his first Most Popular Driver Award for the NASCAR Cup Series in 2018, marking the return of the Elliott name to the trophy. In 2015 and 2016, he was recognized by SportsPro Magazine as One of the Top 50 Most Marketable Athletes in the World. In 2012, he was named one of the NASCAR drivers 25 and under to watch by FOXSports.com. In April 2011, he was recognized as Sports Illustrated’s High School Player of the Week. Later in 2011, Elliott was voted by fans as ESPN the Magazine’s “NEXT” racer, which highlighted up-and-coming young athletes that ESPN considers on the cusp of stardom. It’s no surprise that the future of NASCAR racing is in capable hands with Elliott at the wheel. After all, he hails from Dawsonville, considered by many to be the birthplace of stock car racing. View Chase’s career stats at racing-reference.info.